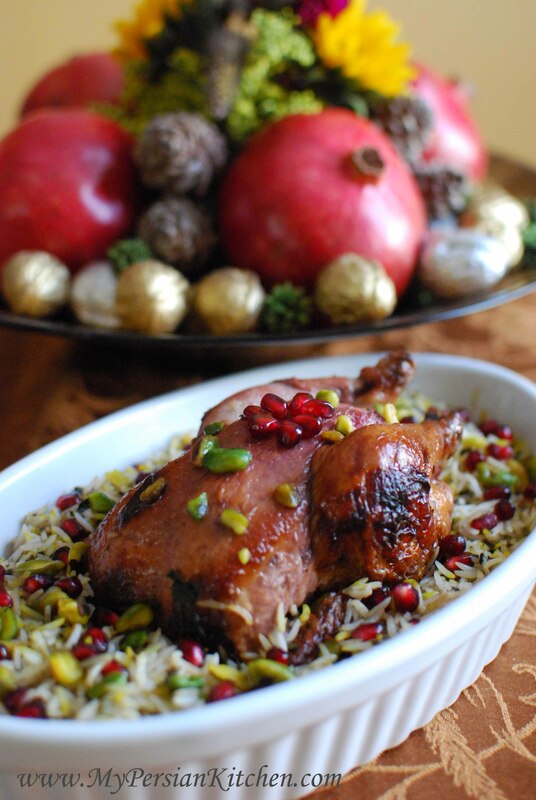 Continuing with the theme of Pomegranate Week and POM Wonderful Dinner Party, here is my third recipe! I love Cornish Hens and I love a good glaze on my chicken or turkey! This glaze is very easy to make and it tastes best when it sits for a little while for the flavors to come together. The more you brush the glaze on the bird, the more color you will end up in the end. Since I had a lot of pomegranate sent to me by POM Wonderful, I juiced a few of them in order to use them in this recipe. But bottle juice is just fine as well!!! Saute shallot in 2 tablespoons of butter until translucent. Add pomegranate juice, sugar, lime zest, and lime juice. Simmer on low and let reduce by half. Season with salt and let sit for at least one hour. Thin slice onions and mince garlic. Saute in a pan in about 2 tablespoons of oil until golden. In the last five minutes of cooking time add ground angelica and mix well. Strain the glaze and discard shallot and zest. Bring glaze back to a boil. Add 2 tbsp of butter and stir until butter has melted. Once the butter has melted the glaze is ready to be brushed on. Wash and pat dry each bird. 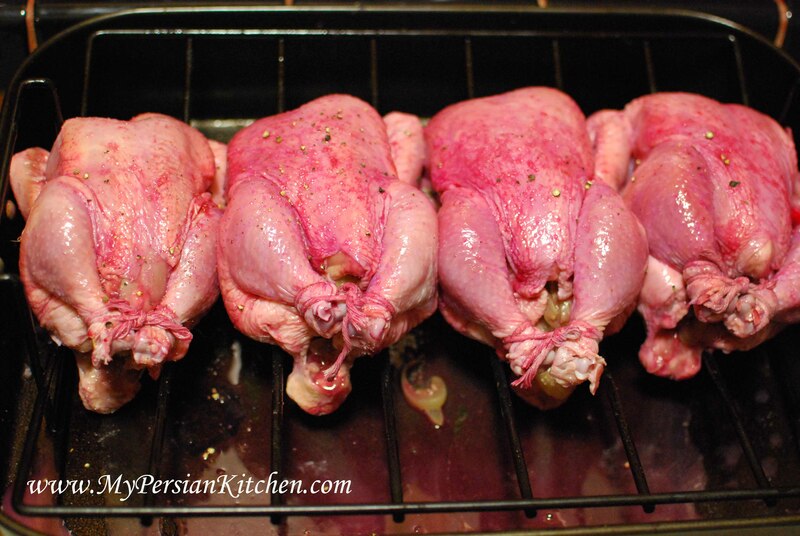 Brush the inside of each bird with the glaze. Then salt each cavity and stuff with cooked onion and garlic. With a cooking string tie together each bird’s legs. Brush glaze all over birds a couple of times and season with salt and pepper. Place in a baking dish or rack with wire. Roast birds at 350° for 1 hour and 10 minutes. During this time baste with glaze every 20 minutes. Increase temperature to 400°, baste one last time with glaze, and cook for 20 minutes longer. 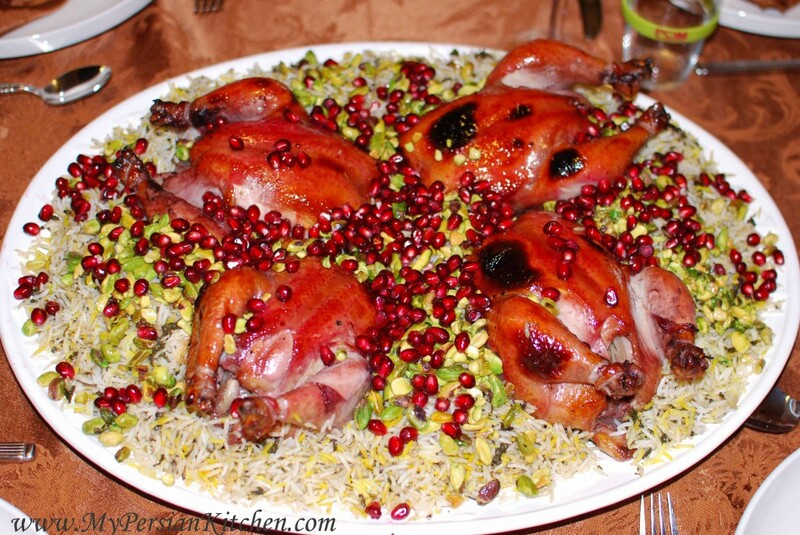 Serve Pomegranate & Lime Glaze Cornish Hens over Rice with Pistachio & Pomegranate Arils! thank you for the chicken recipe. But what is angelica seasoning? I cannot find it anywhere. Nazy, angelica is a spice and can be purchased online.